To make the base, first melt just under half of the butter. Break the graham crackers into a food processor and pulse until sandy in texture. Add to a bowl with the melted butter, mix well, and press into the bottom of the tart pan. Place in the freezer for approx. 15 min. to set. 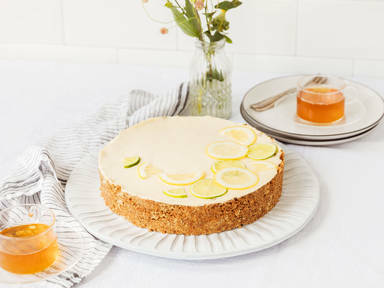 To make the honey-lemon filling. Melt remaining butter and let cool. Juice lemons and reserve the zest of one-fifth. Add lemon juice, eggs, egg yolks, honey, and melted butter to a saucepan set over medium-low heat. Whisk well until thick, approx. 10 min. Cover the honey-lemon curd with plastic wrap, making sure the plastic is touching the surface to prevent a skin from forming. Place in the fridge to cool to room temperature for approx. 10. min. Once cooled, fold the cream cheese in along with the lemon zest. Pour the filling into cooled tart crust, refrigerate overnight, and enjoy the next day!